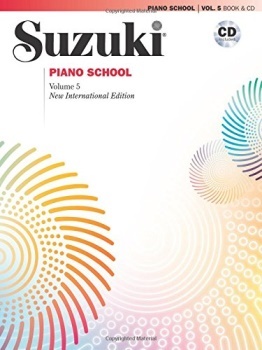 The New International Edition of Suzuki Piano School, Volume 5, includes French, German and Spanish translations as well as a newly recorded CD performed by internationally renowned recording artist Seizo Azuma. Now the book and CD can be purchased together or separately. The contents have changed to include Romantic pieces: Schumann's "About Foreign Lands and People" and Chopin's "Waltz in A Minor." Daquin's "The Cuckoo" has been moved here from Book 6. Schumann's "First Loss" and "Siciliana" as well as J. S. Bach's "Prelude in C" have been permanently removed.